Timberlake’s first day was a bull’s eye! The bugle went off at promptly 7 this morning marking the start of the first full day of camp. Campers made their way down to a filling breakfast of oatmeal cakes and bacon. It was an odd sight to see some with paint still on their faces from initiation the previous night. Twenty-four campers were initiated into two great tribes: the Seminoles and the Iroquois. Chapel was held afterwards where the ugliest camper competition (whoever had the most paint on their face) took place. Houston J. won! Chapel then lead into cabin cleanup which is an opportunity for the campers to work together as a team towards a goal. Cabin Area Directors serve as judges to score each cabin based on cleanliness out of 10 points. The cabin with the highest cumulative score after the two week session wins a pizza party. Chores are split up and each camper gets a different role in cleaning each day. Today’s cabin scores brought a bit of a surprise to camp when Tomahawk Cabin, composed of 6-8 year olds, took first place with a score of 9.25/10. Their hard work definitely paid off because their counselors planned a late night trading post raid as their reward. The first full day meant the first time of the summer for the greatest activities Timberlake has to offer. The beginning portion of each activity was spent covering the safety talk. This is a simple procedure where counselors give an explanation of the rules and regulations. For example, in riflery and archery they covered the range rules and range commands. Fortunately the one hour block of time for each activity made it possible for every activity to start after these talks. Bows were released, rifles shot, and soccer was played. In swimming Greybearder’s (the oldest cabin) started their mornings in a refreshing way working on their freestyle in Lake Doris. 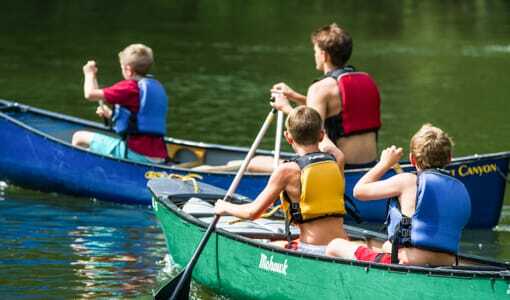 On the other side of the lake, canoeing class worked on strokes and key concepts such as “lose hips save ships”, as well as practicing good communication. Camper William M. offered a helping hand to the instructor and his input was noticed and appreciated. In fencing class, campers worked on their footwork and basic technique. 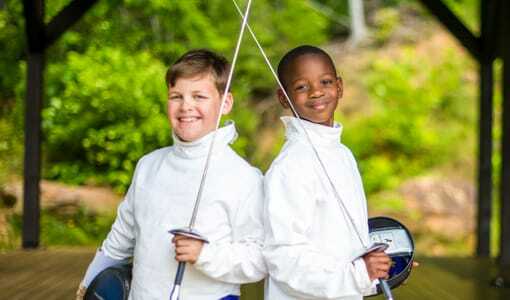 Peter Marty, a Greybearder, showed great leadership skills in assisting with teaching some of the unexperienced fencers. 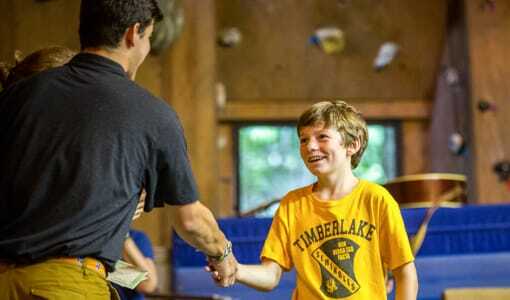 One great aspect of Timberlake is that we encourage our older campers to assist in activities they are skilled in. 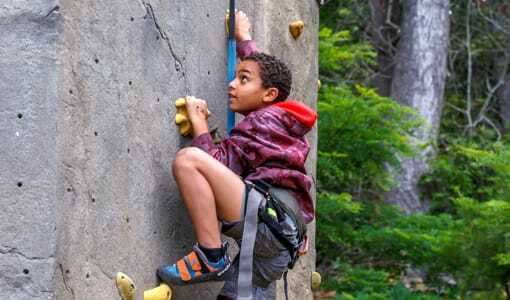 It offers them a great chance to get more actively involved; and the younger campers who look up to them respond well to it. During Free time the waterfront was opened up for swimmers and blobbers alike. Hugh C. and Houston J. had the honor of being the first people to use the blob this summer. Also camper Jimbo D. tried the blob and soared the highest his first time. Another huge hit during free time was Thunderball. It’s a game that is a mixture of dodge ball, handball, and wall ball; needless to say campers loved it. Keefer M. dominated one solo game and won it all. In wrestling class, campers worked on basic techniques such as stance, footwork and double-leg takedowns. 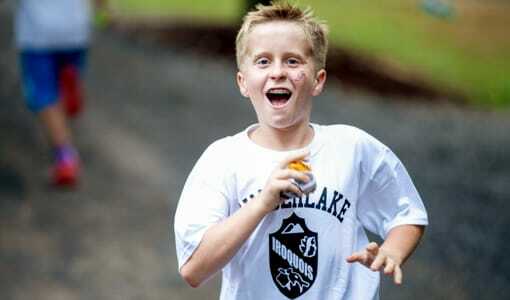 The whole class showed great potential, especially Mitchell J. who was a natural for the sport. The twang of a bow could be heard at the archery range. Wyatt S. had a spectacular first day at the range where he shot well from 30 yards out. 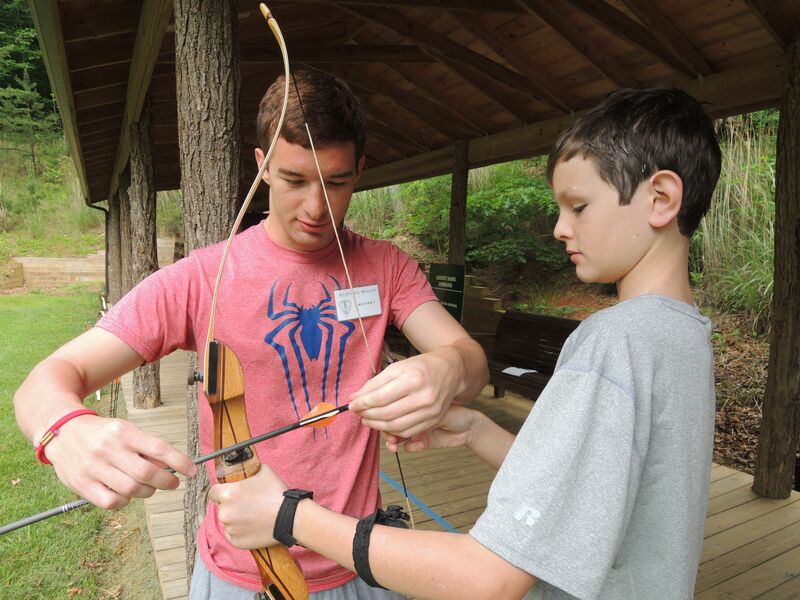 Scott K., as well as a few other campers, picked up archery so well that a few bull’s-eyes were shot. At our new and improved paintball/airsoft course a few battles occurred. Thompson B. led the charge in one game taking multiple opponents out. In backpacking, counselors led groups through the Tomahawk Trail, where Michael A. and Mason B. showed a knack for hiking. In this activity campers also learned the proper way to gather firewood: a valuable skill they will always need in the outdoors. Before dinner, campers and counselors put on their Sunday gear for the session’s photo. Each time we take photos the photographer gives a dollar to the person with the best smile. We had a delicious meal of spaghetti and meatballs and during dinner the evening activity was announced. Drum roll please….Sock War! The Timberlake classic pitted Seminoles vs. Iroquois in a very intense game, but you will have to tune in tomorrow for the results. A new implementation here at Timberlake is the post-evening activity activity. Yes, you heard that right post evening activity activity. Here at Timberlake we understand the more engaged boys are the more fun they are having. For example, after sock war cabins Big Slaty and Greybeard will be enjoying a free swim. 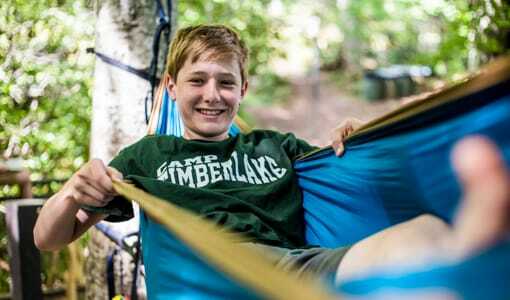 Cabins Little Piney and Stompers Knob will be enjoying s’mores and bonding around a campfire. That’s just to name a few. You could fill a book with all the great activities that occurred today at Timberlake but this article has to come to an end. Needless to say today has been a day of fun, growth and adventure and this will only progress as the session continues. Campers and staff are looking forward to another fantastic summer and today was a great start!